Don’t Know What To Post? Read This Post TODAY! You grab your morning coffee and fire up your computer for the day. You glance at your to-do list. It is long, but you are energized because, well, you are running your own business! And that in itself makes you want to dance a jig (when you’re not so tired from working so hard). But then your eyes get to a hastily scrawled note added after the fact to the page. You sigh deeply. You sigh again because you know you didn’t do it yesterday, you probably won’t do it tomorrow, and you reaaaallly don’t want to do it today. Post to social media TODAY!! TODAY actually meant yesterday, and the day before, and probably the day before that. “What do I post?” and “Where to find the right information?” is something that I regularly hear from my clients, and truth be told I pretty much hear it from everybody who wasn’t born with social media already in their lives every minute of every day. Do you find yourself staring at a blank Facebook “Status” box more often than you’d care to count? We’ve all been there, yes even me. So let’s stop the agony and procrastination with a little bit of healthy planning and you will see how easy (and actually time saving) social media can be when you do it right! 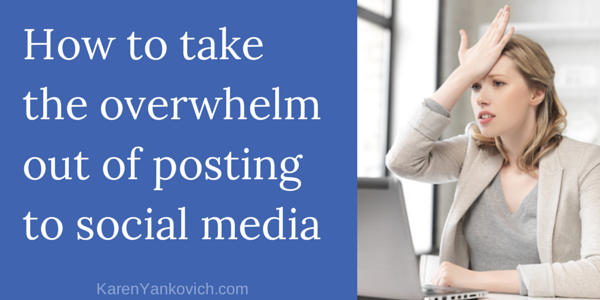 Let’s stop the agony and procrastination with a little bit of healthy planning for social posts. First: You must make content curation something you do way ahead of time. Create a Dropbox or Google Doc folder, even Evernote will work. Something you can access from all of your devices. Because if it’s not convenient it won’t happen. When you are online in your daily business and home routine and you see pictures of something you’d like to share, just save it to that folder you have created. Dropbox and Evernote both have icons you can place on your web browser that allow for drag and drop or click to save uploading that makes everything happen in about 2 seconds flat. Dedicate just a little bit of time to research each day. This feels a whole lot better than “I must create something to post today.” Just take 5 – 10 minutes daily (or make it a weekly longer habit) and spend some time on Pinterest, Twitter, or Facebook. Search out your relevant terms. Watch what comes up and keep saving these pictures to that folder. Second: When you sit down to share a post go to your content folder first! Look through your stash of photos and visual media and decide which fit best the platform you are wanting to post on today. Click copy, save and share – all in a matter of a couple of minutes. No deciding, no hemming, no hawing over what might be the perfect post. Because I will tell you right now – there is no such thing! Third: Do this same process for text type posts. Give yourself a bit of time each day or each week to sit down and just free write a bunch of Twitter sized posts. Create a new sheet/document/file for each type of content. For example you might have a quotes list, a statistics list, your marketing messages would be a good spreadsheet to start, as well as short posts with links to each of your blog posts. Every time you come across something online, find a link you want to share, come up with a marketing message that you would like to get across, just add it to the relevant tab with (or without) a link to match. Fourth: Watch that list of posts grow over time so you never feel at a loss again. Remember this is all done ahead of time, a few minutes here, 15 minutes there. Set up the foundation of folders and files so you have a place to set this information down and easily retrieve it later. Try it and let me know what you think. I promise you, you will like it. Have questions about how to set up these tabs and sheets and folders? Want me to take you through it step by step? Just join my LinkedIn group! In the group, I answer everyone’s questions personally, and I’d love to answer yours. Great tips Karen! I agree, curating ahead of time is a huge saver, and batching it out saves so much time! Great reminder about healthy planning…I think I will apply to dinner too. I usually sit down every Sunday night for about three hours and schedule my posts and my husband’s business posts. I like the idea, though, of adding to dropbox folder. excellent tips, karen! i just began (in the new year) planning my posts and scheduling them. but so far i’ve just been jotting them down in pencil on my calendar. i like your more organized and detailed approach to social media posting. As much as I am a last minute poster, I have to say all your advice is sound. When I DO follow your tips I am much happier in the end — it’s quite a relief. You can also use tools to schedule ahead. I’m not a fan of Hootsuite, but Buffer is great, and Edgar is awesome (though expensive). Awesome post — I love your tips on keeping a database of content pre-curated that you can use for social media.